Celebrating Mid-Autumn Festival? Make sure you try out some tasty treats! Moon cakes are specialty pastries that are filled with a diversity of unique fillings from fruits, nuts, to even dried egg yolks! Find them at your local Chinese grocery or make them yourself! The Mid-Autumn Festival (zhōng qiū jié 中秋节), also known as the Moon Festival, is a popular harvest celebration, dating back over 3,000 years to moon worship during China’s Shang Dynasty (shāng cháo 商朝). The Mid-Autumn Festival is held on the 15th day of the eighth month in the Chinese calendar, or around mid-to-late September in the Gregorian calendar. It is a date which corresponds to the autumn and spring equinoxes (chūn fēn 春分) of the solar calendar when the moon is supposedly at its fullest and roundest. The traditional food of this festival is the moon cake, of which there are many different varieties. The Mid-Autumn Festival is the most important holiday in the Chinese calendar after the Chinese New Year, and is actually a legal holiday in several countries outside of China as well. Farmers celebrate the end of the summer harvest season on this day. 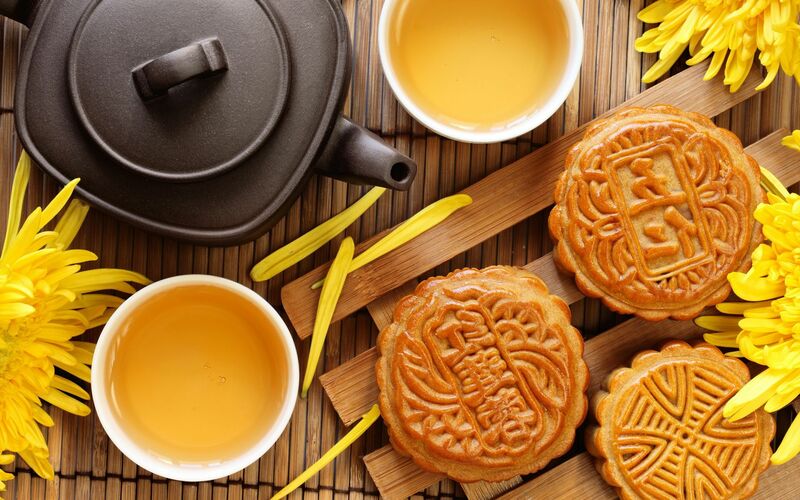 Traditionally, on Mid-Autumn Day, Chinese family members and friends will get together to admire the bright mid-autumn harvest moon and eat moon cakes (yuè bǐng 月饼). Accompanying the celebration are additional cultural or regional customs, like going to a local lantern festival or solving traditional Chinese riddles. How do most people celebrate in the states? Because most Chinese living in America do not have breaks from work or school during this festival, they are unable to return home and celebrate it with their family. They choose to have dinner together with friends and share moon cakes with them instead. The longer students have been in the states, the less likely they will be to celebrate this festival in the traditional fashion. The younger generation (post 80s or even 90s), in fact, prefers simply to talk to their parents over the phone and celebrate the Mid-autumn festival with their friends in the states. As of late, there have been two new trends related to the Mid-autumn festival. The first is to make Snow Skin Moon Cakes. Snow skin moon cakes are no-bake moon cakes originating from Hong Kong. Because of their high visual appeal (gao yan zhi, 高颜值), students enjoy creating them from scratch and posting pictures with them afterwards on social media. If you want to celebrate this festival with students, you can hold a moon cake making session and create this beautiful Snow Skin Moon Cake with them. You can find many videos on youtube to learn how to make them. The second trend is to joke about WuRen Moon Cakes (wu ren yue bing 五仁月饼). They are called WuRen because they contain five (wu) ingredients: peanuts, walnut seeds, sunflower seeds, almonds and pine nuts. Many in this generation believe the WuRen to be the worst and strangest flavor of moon cake. There is a significant population, in fact, who actually want them discontinued forever. If you jokingly ask a student if they like WuRen Moon Cakes or make fun of this cake with them, students would definitely be surprised with your moon festival savvy!